, Uluru-Kata Tjuta National Park. It is deeply sacred to the Anangu people, who have lived there for more than 30,000 years. It’s also home to a wide range of species, 21 mammals, 73 reptiles, 178 birds—and Australia’s most iconic natural landmark, Uluru. Starting today, people across the world will be able to visit Uluru-Kata Tjuta National Park on Street View, walk on the desert sand and enjoy the vibrant hues of the rock—from ochre to rust to wild plum and charcoal. Standing 348 m (1,142 ft) high, and with a total circumference of 9.4 km (5.8 mi), the immense scale, colours and contours of Uluru stir a sense of reverence. While visually and geologically extraordinary, the physical features of Uluru hold a deeper meaning for its traditional owners. For Anangu, the land carries sacred songlines—creation stories about the journeys, battles and adventures of their ancestral beings. All aspects of Anangu life are governed by Tjukurpa,the knowledge which guides relationships, values and behaviour. At the core of Tjukurpa law is a deep respect for the land. Anangu believe that if they look after the land, it will look after them. These teachings are passed down from generation to generation through stories, songs and inma (ceremony). 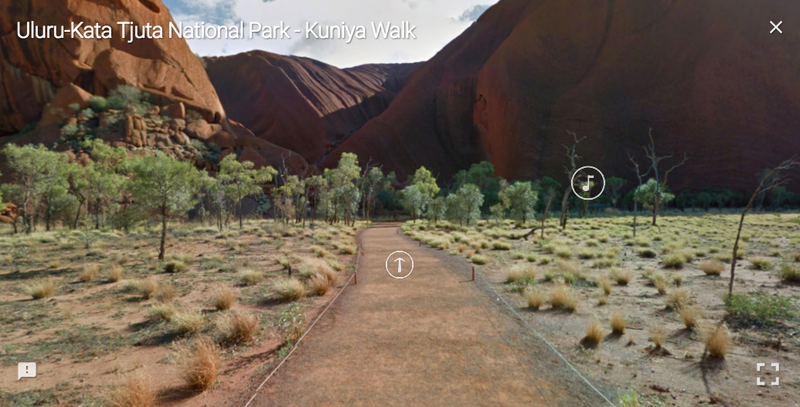 Over the past two years, we collaborated with Anangu Traditional Owners of Uluru-Kata Tjuta National Park, Parks Australia and the Northern Territory Government to capture the park for Street View according to Tjukurpa law. The Street View journey ventures to the vista of Talinguru Nyakunytjaku, the winding trail of the Kuniya Walk, the cool respite of Kapi Mutitjulu (waterhole) and ancient art at Kulpi Mutitjulu (Family Cave). It invites you to zoom in on the curves, crevices and textures of Uluru—and gaze up at its glowing gradient of colour. Since 2007, Google has mapped imagery of unique locations across 83 countries, including heritage monuments, touristic sites, museums, national parks and transit locations across the globe. In the case of Uluru-Kata Tjuta National Park, Tjukurpa warranted a more nuanced approach. For Anangu, there is no distinction between the physical and metaphysical, or the animate and inanimate. People, earth, plants and animals are inextricably connected. This means that Uluru-Kata Tjuta National Park could never be truly represented or understood (virtually or otherwise) without the presence and voices of its people. We knew we had to bring these cultural and spiritual dimensions to the Street View experience. So we used the Story Spheres platform to add immersive audio stories and songs of Anangu traditional owners to the 360° Street View imagery. The result is an interactive, audio-visual guided tour, narrated by Sammy Wilson and with song and music by Traditional Owner and Anangu Elder, Reggie Uluru. Because Tjukurpa teachings are traditionally handed down through an ancient oral tradition, Anangu stories, songs and ceremonies are largely unrecorded. The generosity of traditional owners has made a rare and revered piece of culture available to, and archived for, the world. Together with our partners, we’re privileged to help celebrate and preserve Anangu culture through technology. We hope this model will lead to stronger partnerships with indigenous communities across Australia—to share more sacred sites and instill greater value and respect for the land. In the heart of Australia’s red centre lies the UNESCO World Heritage site, Uluru-Kata Tjuta National Park. It is deeply sacred to the Anangu people, who have lived there for more than 30,000 years. It’s also home to a wide range of species, 21 mammals, 73 reptiles, 178 birds—and Australia’s most iconic natural landmark, Uluru.